Playing with the flying horses and the trapeze-ing monkey on the baby seat. She is also seen to be shaking the cube that grandpa bought for her. She likes the sound of the bell made by the chick! 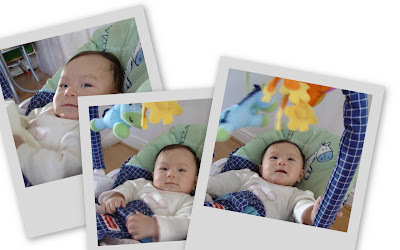 Tummytime made more fun by the Mamas & Papas butterfly which has twinkling lights. Finger licking good! Time for contemplation while chewing on her fingers/thumb/fist. 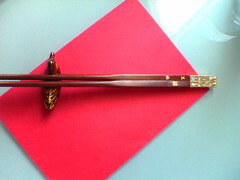 136, originally uploaded by Tsu Lin. Tomorrow - 30 September 2007 will be hubs and my wedding anniversary - It's been a year! Last year at this time, we were preparing for our registration and the dinner afterwards in Melbourne. It's still very fresh in my mind - 30 Sep 2006 was a busy day for us. 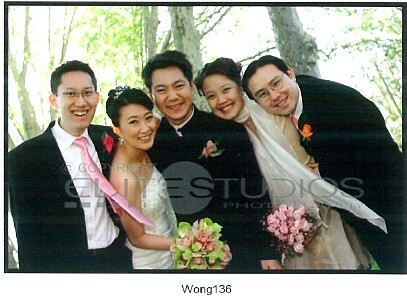 Before the groom came to pick up his bride (me), I never slept a wink that night! I tossed and turned in bed and waited and waited to fall asleep, alas, I never did.. and before I knew it, it was 6am, time to wake up and get made up. The hubs and entourage came to our place for the "jip san leong" later and we headed off for the tea ceremony at my in-laws. At 2pm, we had our wedding registration at the Marriage Registrar's office and afterwards, we headed off to the nearby park for photoshoot. The photo above was taken in the park. Dinner was equally memorable... the company, the good food and great memories! Thanks to my in-laws for planning the entire day as both of us were not physically in Melbourne to do the planning ourselves. A year on and we have our little bundle of joy - how time flies! She now sleeps longer at night, but stays awake longer during the evenings as well. Before this, she will sleep 7pm - 11pm/12am, then feed and sleep from 12-1am to 4/5am for another feed. Hence a total of TWO feeds. 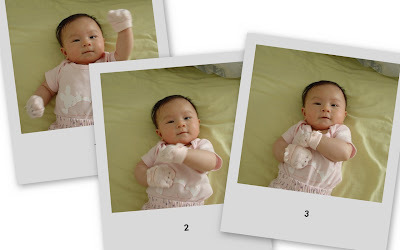 Starting from week 12, she stays awake during the evening till 9pm, then after her feed, sleeps for 6 hours. A few nights, she slept from 11pm till 5am or 6am. Hence a total of ONE feed. We bought a bolster aiming to help her sleep. The truth is, it is too big for her. 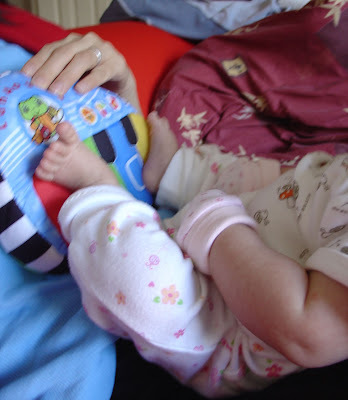 But it is helpful at times when she is really tired - I turn her to her side and put her arms on the bolster. In 2 minutes, she falls asleep. 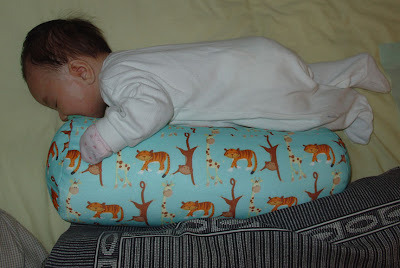 I then remove the bolster as her arms are too small to wrap around it fully and it (the bolster) has no use after that. More "purposeful" (phrasing from chip-pea), but to me, it also shows that she knows the cause and effect of her actions. For example : she knows that by using her hands to hit the arch hanging over her baby seat, the toys will move, and THAT will entertain her! So, she hits it over and over, and laughs joyfully! I am most impressed by this observation. Hitting the arch to shake the toys! Playing with her toy piano. She can kick it and enjoy the music. She has found her fingers fascinating! 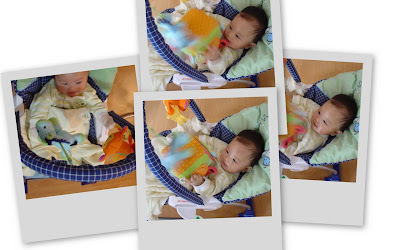 She started to stare at them (at around week 11) and is exploring their use on her hands. But due to her eczema, I have put on mittens for her starting Week 12, with some "time out" (for the fingers) a few minutes a few times a day. For 2 years, this blog has been known as SUNBABIES - A nick I used since college, penned by a dear friend Alicia - one third of The Jacksons. Today deemed appropriate that it should be known as tsulin plus plus, complemented by a change of skin as well. Today also coincides with my little darling turning 3 months and a day old. "This is how you hug me", Shean Wenn shows. You must agree she looks fab in pink, no? The bunny top is among the many many beautiful gifts from SIL, Daphne. I - Uh, i mean Shean Wenn - love it! During her eczema episode, we have decided to get her mittens to avoid her from scratching her face. Of course, I'm constantly trying to improve the layout. Have not figured out how to insert the lilypie ticker. Praveen, any hints? Yes, it's a coincidence my title here is similar to your latest entry! Yesterday, I discovered Samoa's Siva Tau, a version of the All Black's Haka. After what seems to be "the match of the games" (Springboks vs Tonga), I sat myself down, with baby near me to watch this. The game, as expected was won by England. Shean Wenn seems more excited than I was, laughing along as the Samoans did the Siva Tau. She slapped her thighs and shook her head in laughter! What a golden moment... if only I had fingers as fast as the English scored their tries in the England-Samoa game. There's a cool video of the All Black's Haka vs Tonga's Cipi Tao. Watch it here. We all know who will win the Cup! I did not even bother watching their game this afternoon. I have some interests in Rugby, I believe I have some passion in it (especially watching the All Blacks), and while I may not know still, the difference between Rugby Union and Rubgy League.. at least I am not as clueless as when it comes to cricket or tennis. But as with most sports, I believe my passion has its limit. That is, unless I was born in the 60's.. then I would most certainly be cheering for the Malaysian Football team of the late 60's/early 70's. I found yesterday, much to my joy, an article on the team on Wikipedia. I told my uncle whom I was chatting online "Hey, your name got mentioned in an entry on Wikipedia about the M'sian Football team who went to the Olympics". He said the article has a slight mistake. Sau Chi Keung (gk) and Santokh Singh were not in the line-up for the 1972 Summer Olympics. I am proud of him. Gone are the days where they played for passion - a truly M'sian Football "Dream Team". The wikipedia entry is found here. Shean Wenn's own version of her favourite sports : Freestyle swimming. This is how you do it, mom! 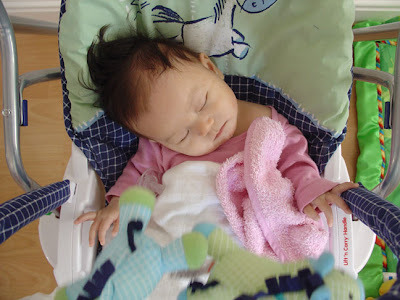 Shean Wenn fell asleep on the rocker/swing while listening to the CD MIL bought for her. So, what did I do to seize the moment? Well.. I ate, washed up, made some phone calls and sat myself infront of the laptop and SURF. She will wake up soon for her feed. Grandma left for Bkk on 2 Sep and both of us are missing her! But as soon as grandma left... Shean Wenn achieved a BIG MILESTONE. She can rollover now (well, sort of, see "Technical Info" below). I still did not believe it. So on Wednesday, after putting her down on the bed on her back and making sure that she is safe, I went into the kitchen to grab something to eat. While in the kitchen, I heard a soft cry, the kind of cry of like someone is trying hard to push something. I went into the bedroom and lo and behold! My little 2.25 month old baby is on her tummy! I was beaming with pride!! The little Shean Wenn, of course is crying in sheer determination as she got her right hand tucked under her body and was trying to free it. I laughed and watched her as she rolled on her tummy from side-to-side trying to free the right hand. It is comical! Of course she didn't think so and after letting her cry out for a minute, I decided to lift her up and cuddle her. I whispered in her ears how proud I am of her. "My little girl has really done well", I told her, while trying to sooth her. These days, she would be hard at practice most of the time whenever she is left on her back on the bed. 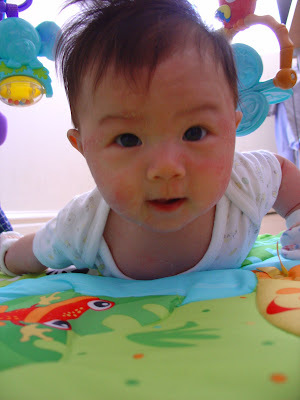 She even tried rolling over in her cot, but due to space constraint, she could not achieve this feat yet. Her turning ratio is rather big (ok, getting technical again). Haha. So, do you know the difference between a fungal infection rash and an eczema rash? Well, I don't. But I expected my GP to know. Let's call him Dr Bat. 2. Her poo is normal for her age. 3. Her appetite is good. So, with this diagnose, he prescribed Clotrimazole with Hydrocortisone Cream to treat it. Using this cream, her rashes subsided dramatically within 3 days. It did go away completely though, and after 7 days of usage, I stopped applying it as Hydrocortisone is a mild steroid and might cause thinning of the skin (and as per instruction on the information leaflet). During our next visit to Dr Bat, I brought the matter up, perhaps he should prescibe a cream without Hydrocortisone? He then prescribed Clotrimazole for the fungal inf*ction. I applied this for a week and her rashes DID NOT subside, infact.. her rashes spread to her left face, and subsequently, the whole face (eye brows, near the ears). It has gotten so bad that Shean Wenn was grumpy for a few days and was crying non-stop during her night feeds. At that time, I had no idea she was itching badly.. It had gotten so bad, it was oozing yellow liquids (called "weeping"). I was worried, petrified, even. How can fungus be THIS STUBBORN? I booked another appointment with the GP - as luck would have it, Dr Bat was not available for consult so I made another appointment with another GP. 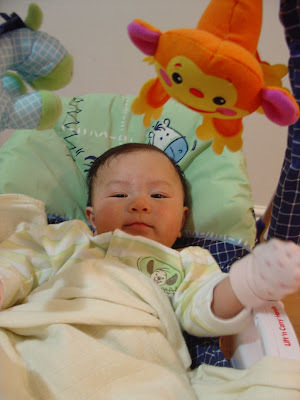 It is very lucky that we got this 2nd opinion, as the Dr told us when she had one look at Shean Wenn "She has eczema". And is this due to allergies? Most likely! She might be lactose- intolerant. I was aghasted! I am appalled that Dr Bat did not make an accurate diagnose eventhough I had suggested that it might be due to lactose-intolerance since I told him *I* was lactose-intolerant as a baby, and still am! He confidently, INSISTED it was not. I am so mad. If he had not make such a mistake, Shean Wenn's eczema would be arrested earlier and while creams cannot totally cure eczema, at least it will help suppress it from spreading to her whole face and made her quality of life better. She did not have to suffer from severe itch and peeling of skin (esp one at her earlobe). Argh! I hope by using the hydrocortisone, it will stop the eczema and in time, she will be able to overcome it naturally. Her eczema has subsided quite abit, it is not as red anymore but it's still "around". Some sufferers of eczema will have a flare-up of it when they eat something they are sensitive to. The common perpetrators are : milk, cheese, beef, eggs, citrus fruits and chemical food additives (with the E-numbers). Although different people will invoke different reaction to these food and not all listed here may aggravate your eczema. Daily management : Ensure that skin is always moisturised. Creams / Ointments : Usually the GP and skin specialist will recommend a treatment course of hydrocortisone or steroid-related creams and oitments. Oral administration :Antihistamines To help control chronic itching, antihistamines can sometimes be prescribed by the pahrmacist/GP. There are two types of antihistamines available : Sedative ones to aid in restful sleep and non-sedative anti-histamines. The British Skin Foundation has suggested that early introduction of solids to a baby increases the risk of eczema. Which means, for a baby with eczema, it is better to introduce solids as late as possible (ie, instead of giving her solids at 4 months, to try to do so only at 6 months). And again, they say "Breast is best". >> If you as parents and any other of your children do not have eczema, asthma or hayfever, there is probably a 1:10 chance that your baby could develop eczema. >> If only one parent has eczema, asthma or hayfever then there is a 1:4 chance that your baby could develop eczema. >> If both parents have eczema, asthma or hayfever then there is a 1:2 chance that your baby could develop eczema. >>If another child has eczema, asthma or hayfever then there is a 1:2 chance that your baby could develop eczema. 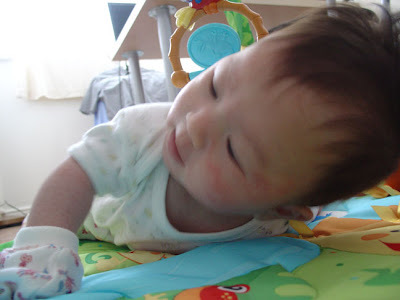 >> If your child is going to get eczema, he / she is most likely to develop it in the first 2 years of life. 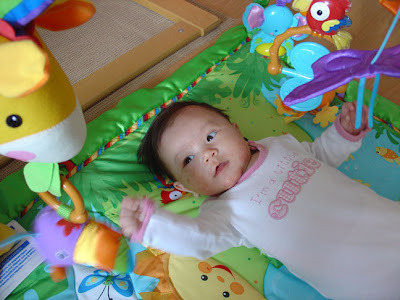 Shean Wenn enjoying 20mins each day on the playgym we bought her! The moral of MY story : Always seek second opinion if your symptoms do not go away after consulting a specialist (GP or otherwise).